About thirteen years ago, I “invented” the short form Xi for extra intelligence and started using it. That choice proved to be constructive and it has offered to many uncommonly intelligent people a practicable starting point to understand themselves better and tell others about their findings. Annelien van Kempen and me had been using the term of “extra intelligent people” as an alternative to “highly intelligent”. 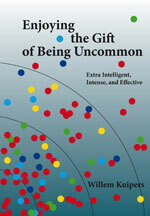 We already had formulated the five characteristics of extra intelligence. While working on a workshop about “Recognition and approach of extra intelligent people in organizations”, together with psychologist Karien Boosten, the definite choice for Xi as the short form was made. There have to be excellent results!? In the first years it was difficult to explain the difference between Xi and giftedness. Not many people were interested in gifted adults at all, and some wondered whether Xi was a kind of “giftedness light”, or even worse as you did not need to establish your IQ-score. Many people had difficulties with the suggestion that the well-known lists of typical characteristics of the gifted could be used reversely: If you have these typical characteristics, it is very likely that you are gifted. Could five or even three items of these lists already be sufficient indication!? And even if true, why introduce another name like Xi for it? For me it was (and is) clear that for many people – experts and the public – giftedness is strictly tied to excellent results in some domain, and starts with a very high IQ-score. While I was looking for a more neutral and factual term for a specific pattern of qualities, or rather, a defining aspect of someone’s identity: being extra intelligent and intense. After all, it was my job as a career coach to help people who for some reason currently did not show excellent results, but were significantly uncommon intelligent. They were not aware, however, of the impact of their intelligence on their situation, or framed it only negatively. So Annelien and I described in 2007 in our Dutch book “Verleid jezelf tot excellentie!” (Charm yourself into excellence!) that being Xi is an essential part of someone’s identity, that influences all kinds of aspects of someone’s life and career. Typical characteristics like “heightened intensity” and “qualitatively different experiences” have been and will remain their lifetime companions. When you become aware of this condition, you can also imagine the importance of establishing your own best workable way to deal with it. In the following webpages of this menu I offer all kinds of information about Xi, e.g. a comparison with giftedness. I am very well aware of the fact that some people will prefer to stick to formally measurable qualities and its implications. But I feel proud and happy to have offered thousands of people a way to discover a hitherto hidden part of themselves that could lead them to new possibilities of expression and performance. All their stories have taught me a lot about myself too, and my way of engaging other people. That discovery tour is still going on and keeping me enchanted: I look forward to hear and tell more stories about Xi and XIPs. My blog will keep you informed on my latest discoveries.